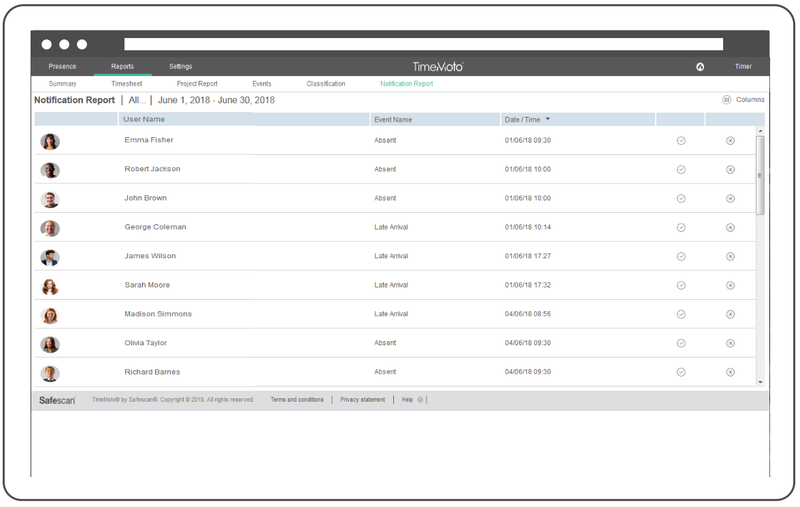 The TimeMoto Cloud offers various kinds of reports to present your data. In this article, we will briefly explain how to use these reports. 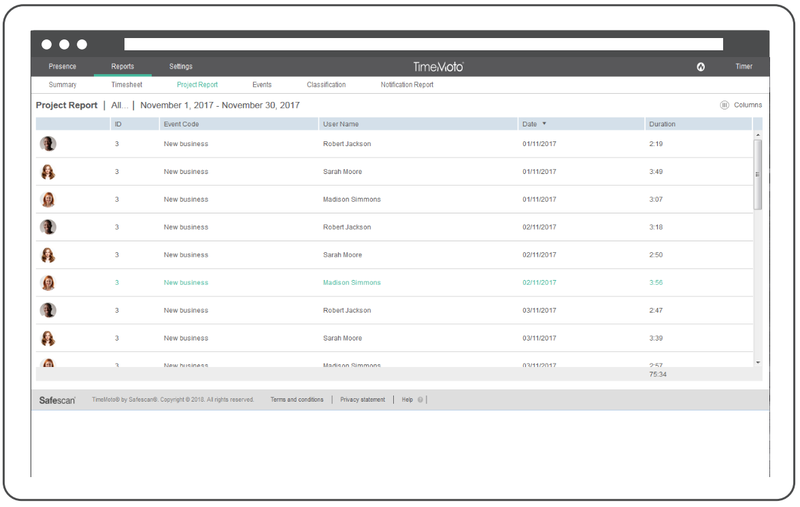 On the Summary page you can see an overview of the time worked by each of your users. All data is summarised into one line per user. You can set the parameters for this report with the filters on the left-hand side. 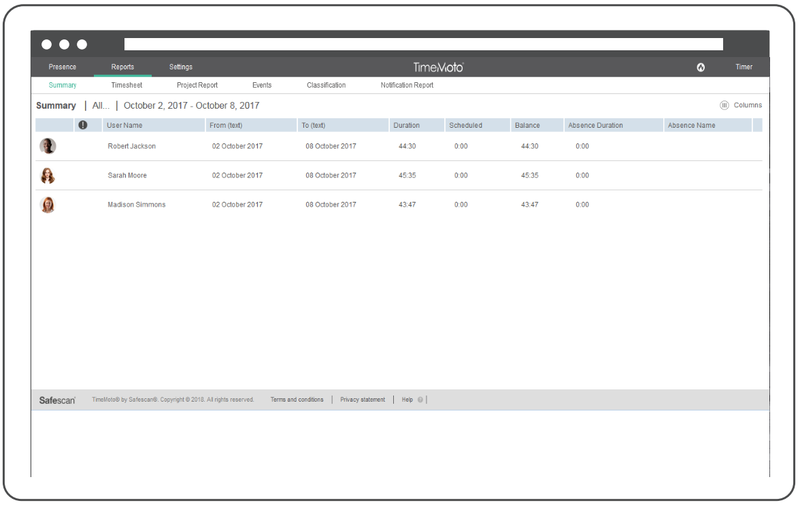 Clicking on a user within this report will direct you to the user's Timesheet. On the Timesheet you can see further details and edit clocking data for that particular user. If the user has a work schedule assigned to them with roundings, the times shown on the Summary report will also be rounded. You can export this data as a CSV or Excel file. The data can also be e-mailed or printed. 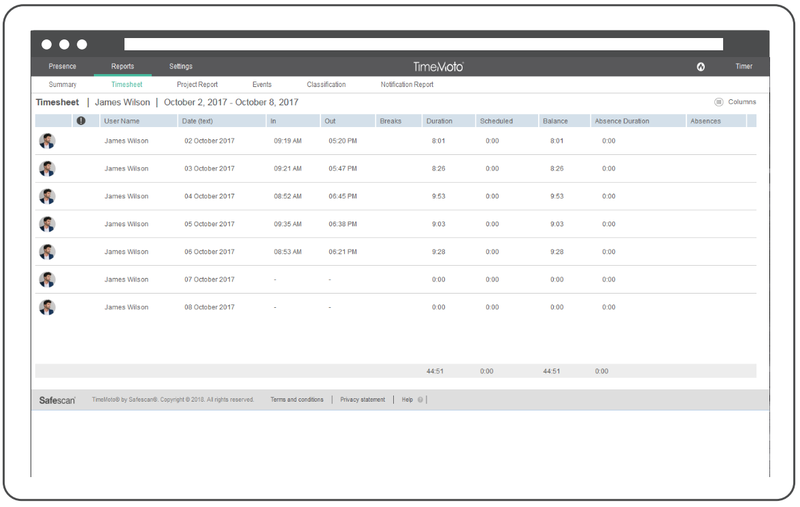 On the Timesheet report, you can see the clocking data for a user on a per-day basis. You can add or edit clocking data by clicking on a specific day in the report. If the user has a work schedule assigned to them with roundings, the clocking data is rounded accordingly. You can export the data as a CSV or Excel file, create a PDF report, send the data by e-mail or print it. The Project Report gives you an overview of the projects your users have worked on. The data will appear on a per-day and per-user basis. It is not possible to edit or add any data on this report. You can use the Timesheet or Event page if you wish to edit/add clock times. If the user has a work schedule assigned to them with roundings, it will not be applied to this report. The Event report will show all of the clocking data generated from a TimeMoto device, the TimeMoto app, the timer on the website, or any clockings added manually. The Classification report shows you the data created as per the rules defined in a Pay Class. Each column shows the amount of hours worked under a specific rule. You can export the data as a CSV or Excel file, create a PDF report, send the data by e-mail or print it. If you have chosen a payrolling system under [Settings] > [General], you can also export the Classification report to a file for your payrolling system. The Notification report shows you all of the notifications you have received from users due to lateness, leaving early or being absent. Notifications are only shown when a user has a work schedule or is assigned scheduled work time under [Settings] > [Planning].